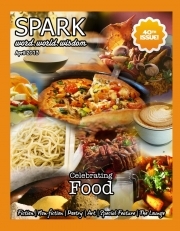 Description of "Spark - April 2013 Issue"
As summer sets in with full force, we are delighted to bring you an issue that we are sure will make you salivate - presenting, Spark's April issue 'Celebrating Food'! We're also excited because this is our 40th issue! Through a series of fiction, non-fiction, poetry and art, we explore the various sides of food: cooking, fond memories and longing for certain kinds of food, and some thought-provoking incidents that surround the most vital component to a healthy life, food. Our special feature focuses on an interesting topic - food photography. We also have The Lounge which gives you the usual fare on music, books and spirituality. Reviews of "Spark - April 2013 Issue"